Boston Handmade: Collecting Supplies... A Family Affair! Collecting Supplies... A Family Affair! Since I have been designing sea glass jewelry and decor - I have been including my children in the hunt for the supplies I use. Both of my girls started helping me scour the beaches when they were around two years old. 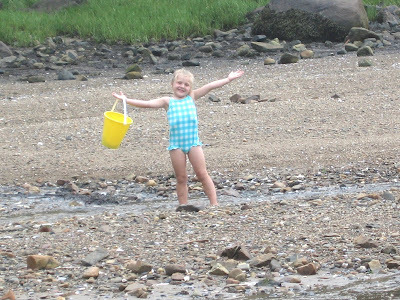 My older daughter is now 15 - and for her, most of the magic of sea glass hunting has since disappeared... but my 4.5 year old knows the smell of low tide... can see when the water has pulled away from the shore... and still wonders what treasures it will bring. Living by the ocean makes it easy to slip away for an hour or two and get "lost" by the waters edge - for us... time stands still. What a wonderful post. I love the idea of including your children in your creative process.